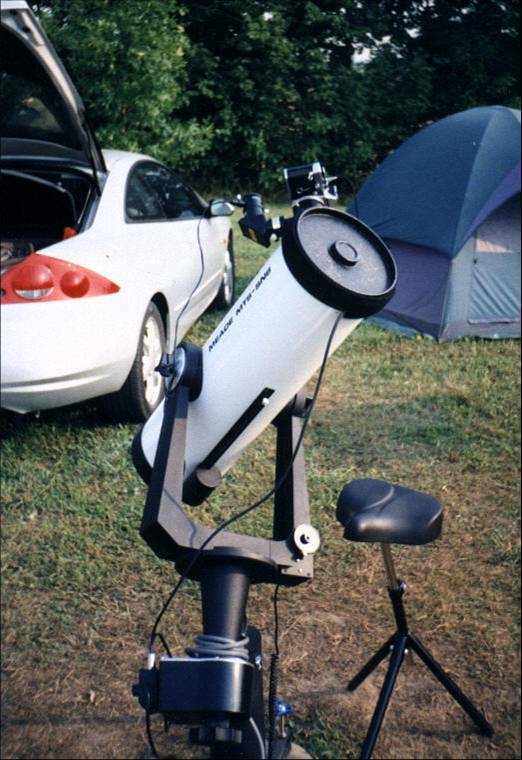 This was my first prime-focus astrophoto set-up based on a Meade MTS-SN6 6-inch f/5 Schmidt-Newtonian telescope, shown here ready and waiting for a night of imaging at the Starfest star party near Mount Forest, Ontario. These scopes were sold new in the late 1980's. I bought this one used in 1995. I observed with it for about five years before modifying it to bring it up to snuff for astrophotography. Aside from the addition of a declination motor and a counterweight bar, both stock items from Meade at the time designed originally for 8-inch SCTs, the scope needed some minor modificatons to the beefy 2-inch helical focuser, primarily to prevent flexure from the weight of a 35mm film camera and to avoid diffraction artifacts from the protrusion of the focusing tube (I chopped it!). I also modified the pier legs with a few parts from the hardware store to allow individual height adjustments, which was essential to level the mount as a first step to obtaining polar alignment. Total investment: about $850 CAD (~$600 USD at the time). Given the solid-steel 1-inch diameter RA shaft and the very nature of a fork mount, there is of course no polar-alignment scope. I achieved precise polar alignment using the drift method, which was time consuming but very accurate. The mount proved to be very stable and the periodic error in the primitive AC drive was relatively easy to manually guide out while looking through an illuminated-reticle eyepiece in a Lumicon 2-inch Newtonian Easy-Guider (an OAG). (For guiding I had also bought a used RA-only Meade AC drive corrector and added declination control and a hand paddle. Did the trick.) I used this setup for film astrophotography from 2002 through 2004. I still have the scope, although it's now more of a decoration in the dining room that I take outside only occasionally for casual observing. BTW, the bicycle-seat "chair" was purchased from Ikea and proved to be ideal for the job. I still use the chair when imaging.